Comet Iwamoto (C/2018 Y1), shows off a pretty, greenish coma at the upper left in this telescopic field of view. Taken on February 4 from the Mount John Observatory, University of Canterbury, the 30 minute long total exposure time shows the comet sweeping quickly across a background of stars and distant galaxies in the constellation Virgo. The long exposure and Iwamoto's rapid motion relative to the stars and galaxies results in the noticeable blurred streak tracing the the comet's bright inner coma. 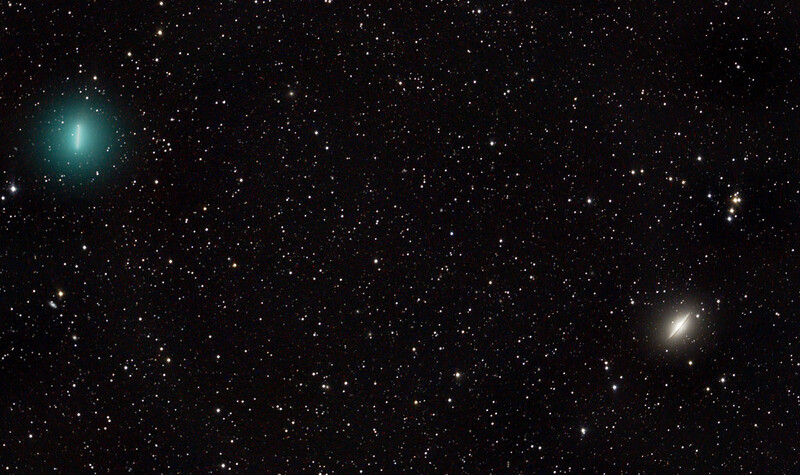 In fact, the streaked coma gives the comet a remarkably similar appearance to Messier 104 at lower right, popularly known as the Sombrero Galaxy. The comet, a visitor to the inner Solar System, is a mere 4 light-minutes away though, while majestic Messier 104, a spiral galaxy posing edge-on, is 30 million light-years distant. The first binocular comet of 2019, Iwamoto will pass closest to Earth on February 12. This comet's highly elliptical orbit around the Sun stretches beyond the Kuiper belt with an estimated 1,371 year orbital period. That should bring it back to the inner Solar System in 3390 AD.